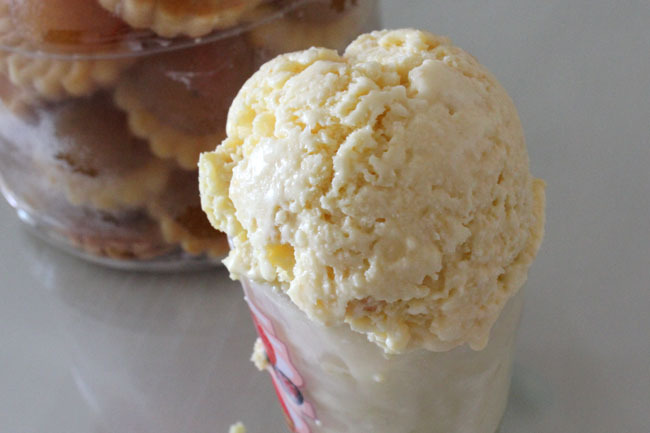 When faced with a tub of leftover pineapple tarts from the Chinese New Year, I decided to make them into pineapple tart ice cream. Crazy idea for my day off, and I thought it should go well with honey. So after an ice cream making course at Tom’s Palette and a $108 investment in an ice-cream maker, it was proud moment when I tasted my first ice cream. Hard work of course! 2. 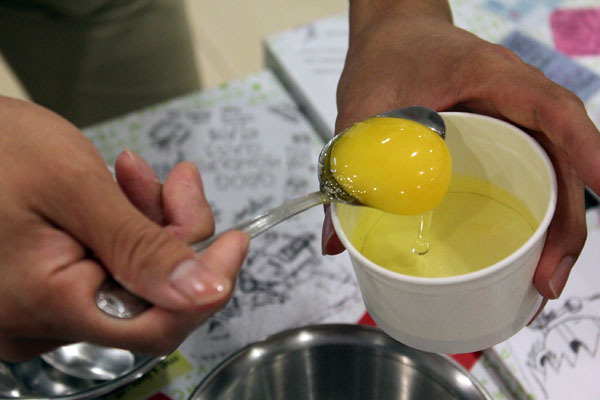 Mix egg yolks with honey and beat till pale yellow. 3. 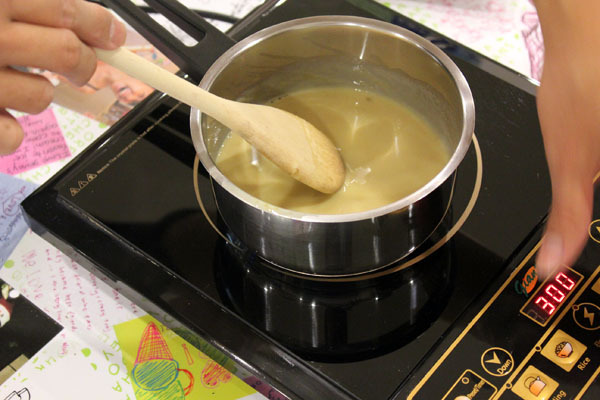 Pour egg-honey mixture into milk and stir on low heat. Cook till it forms a custard-like texture. Pour whipping cream in slowly and continue to cook till custard is formed (Whole process took me close to 10 min. 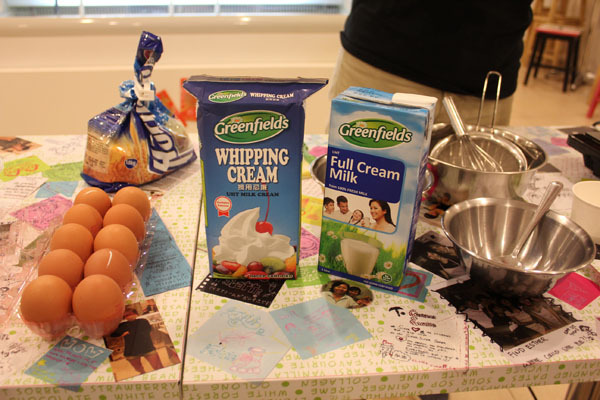 You have to be very patient in stirring here or the eggs would become scrambled!). 4. 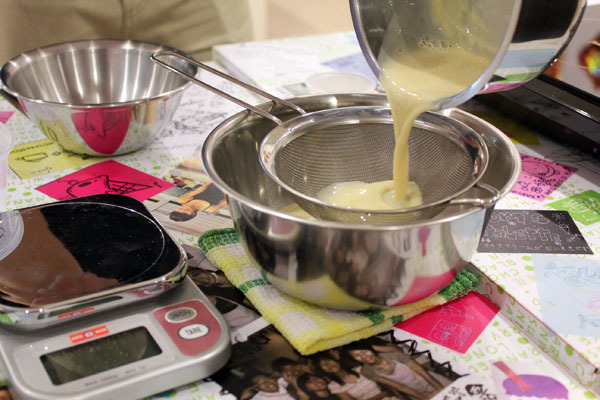 If you want to ice cream to taste smoother, pour the custard mixture through a sieve. 5. Freeze the custard for about an hour. 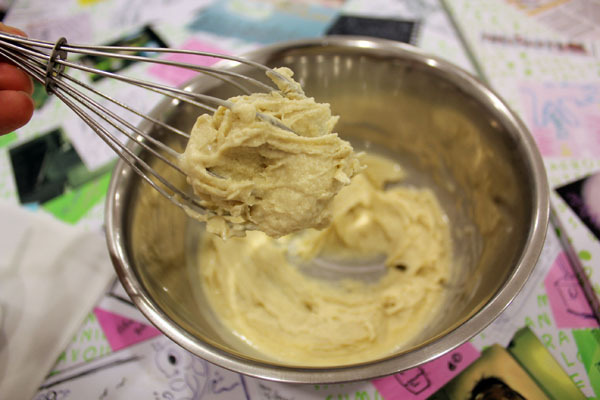 Churn with a whisk in its semi-frozen stage. The more you churn, the more ‘airy’ the ice cream gets. 6. Freeze custard for about half hour. Churn for a second time. It is at this stage when you could add pineapple tarts/cookies for extra bite. 7. Leave in fridge to firm. The most important stages to me are the custard and churning stages. You really got to stir and cook till the mixture is thick enough, yet not scrambling it. The churning stage affects how dense your ice cream is. My advice is, start with small portions and experiment. Have fun! ← I was ‘Sold’ for $82.65! Emmm interesting combine! Pineapple Tarts ice-cream Aiyo we had finished ours or else i can try this Will wait for your Milo recipe soon. The Milo is actually very similar and in fact easier. Just add the Milo to the milk during the early stage. I tried out your recipe yesterday and it was really good! thanks!